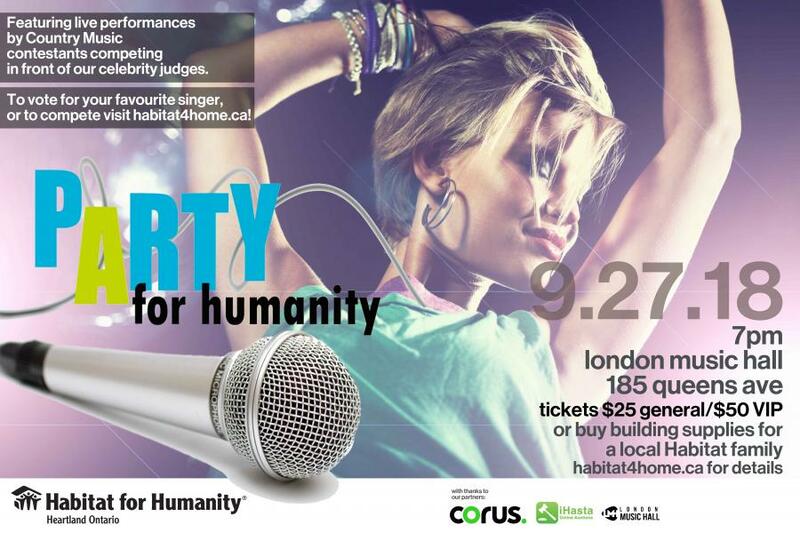 On the evening of Thursday, September 27th, London Music Hall played host to Party for Humanity, and epic celebration and country music competition put on by Habitat for Humanity Heartland Ontario in partnership with Corus Entertainment and iHasta Online Auctions. Finch Auto Group was proud to serve as Presenting Sponsor for this event with our President Ryan Finch even serving as a judge for the competition! It was a wonderful evening replete with food, drink, fantastic company and some truly magnificent performances by a number of up-and-coming local country music talents. All proceeds from the event will go to Habitat for Humanity Heartland Ontario as they seek to continue to build strength, stability, and self-reliance in our communities. This great organization promotes better, affordable living conditions which in turn lead to improved health, stronger childhood development and the ability — and financial flexibility — for individuals to make forward-looking choices. We are truly thankful for all of the great people who made this night such a smashing success and we look forward to continuing our relationship with Habitat for Humanity well into the future!